I feel like I’m digging these notes out of the archives but it wasn’t until the week of Thanksgiving 2011 that I paid a visit to Bettola. Having gotten an early start out of Atlanta, Jennifer and I actually made it to Birmingham in time for lunch. The details of how we picked out Bettola are a bit murky. I want to say it was a combination of friends’ recommendations, yelp, Opentable, Urbanspoon, and dumb luck, but after exiting the interstate we were soon perusing the Bettola menu and waiting to place our order. 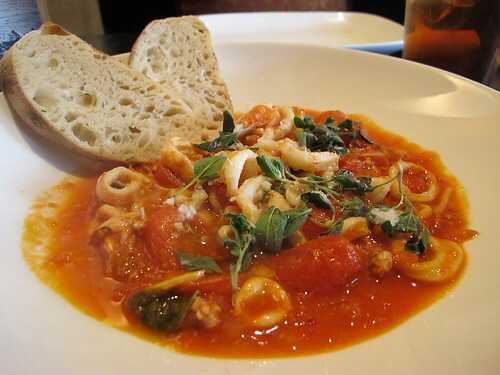 Before delving into any of our entrees, an order of the calamri arostiti arrived at the table. Instead of the usual slightly greasy fried calamari with a cup of banal marinara for dipping, this calamari was combined with bright sugo di pomodoro, hot chilies, white wine, oregano, olive oil and a side of crostini. 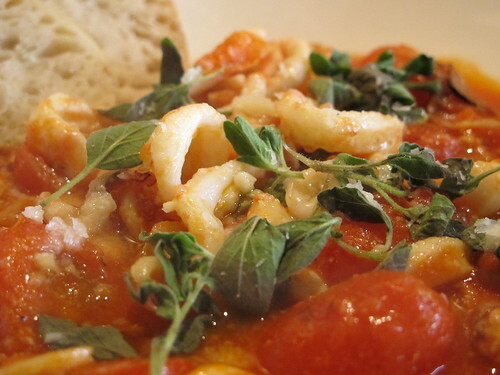 Unbelievably tender, this calamari was swimming in a ripping hot tomato sauce whose sweetness was punctuated by a few springs of vibrant basil. True to the description, there was a touch of chile heat to this dish, not enough to turn anyone off but enough to linger and keep things interesting. Unbeknownst to us, Chef James Lewis and Bettola have garnered quite a bit of press over the past few years. Food and Wine dubbed Lewis as one of the best new chefs of 2011 (I knew the name sounded vaguely familiar) and Portico and Garden & Gun both reported on Bettola’s authentic Neapolitan-style pizzas. 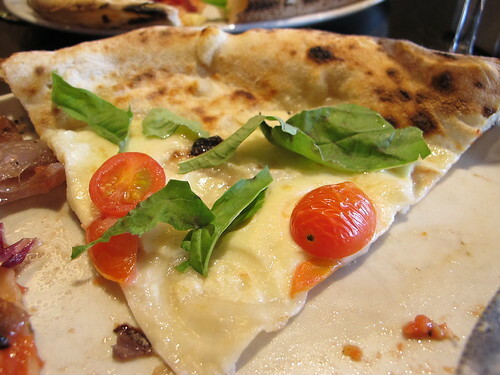 So just how did these Neapolitan-style pizzas stack up? The Filetto came topped with fresh cherry tomatoes, bufala mozzarella, olive oil, garlic, fresh basil, sea salt and a lightly charred edge to the crust. 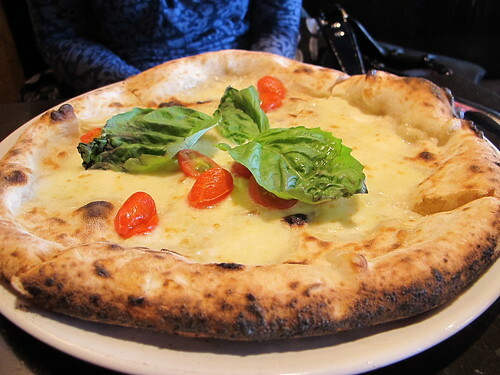 Nice charring aside, there was something odd about this pizza. Maybe it was the sauce, maybe it was the oven but these pizzas were soggy in the middle. Soggy middle or not, the flavors were well rounded particularly the garlic and sea salt, but things improved even more when we decided that lightly torn pieces of basil made for a better slice than three big basil leaves. 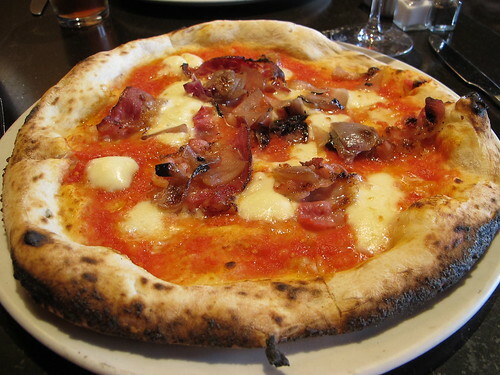 Never ones to turn down the promise of pork and hot peppers, a pancetta e cipolla pizza rounded out the order. with an inviting slightly sweet and salty flavor. However this pizza was also plagued by a slightly watery sauce and a completely limp center. 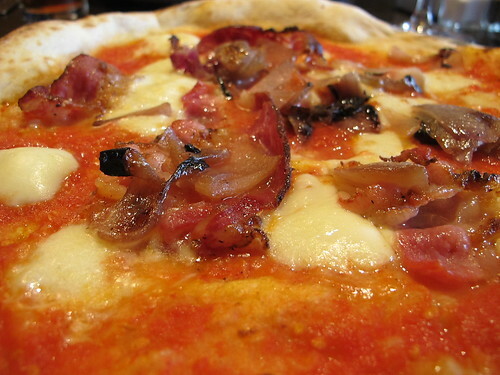 As for the pancetta and onions, the cipollinis were sweet, juicy, and incredibly well caramelized but they also completely dominated the flavor of the pancetta. However when the pancetta did have a chance to shine through, we were rewarded with a burst of salty pork flavor. So after calamari and a couple of pizzas, where did that leave us with Bettola? One could argue that the soggy centers are a sign that Lewis is making a true Neapolitan-style pizza. (For more information about the soggy centers of Neapolitan pizzas, read this article from the Serious Eats Slice Blog) When you take into account that nearly all of the pizzas’ flavors were excellent, that argument holds a lot of water, but what makes me pause is that even with the Neapolitan soggy centers in mind, a Bettola slice still couldn’t take a fold like a slice from Antico. 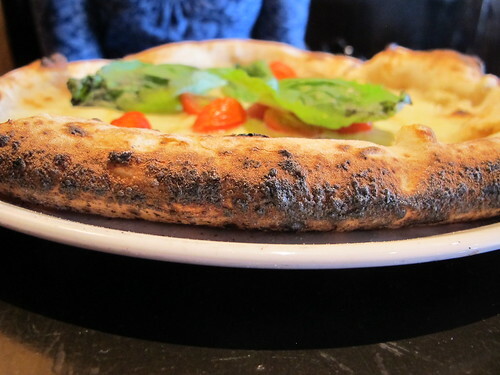 So while the jury may still be out on the structural integrity of the Bettola pizza, it’s obvious that Chef Lewis knows his way around Italian flavors. I would have liked to see what Lewis could do with the full dinner menu, but that's for another time. On the whole, Bettola was certainly worth the effort and provided a satisfying lunch for the trip back home. I've noticed these pizzas are consistently soggy in the middle, but I still love them too much to care. Their crust is perfect, in my opinion.